Reflections and Ruminations: God is good. All the time. Really. Back in 1998, Christian songwriter and recording artist Don Moen gave the world the song God is Good and it quickly became both a catchphrase and a song that gained popularity in the Christian world. There are, to be sure, some songs that have made ‘cross-overs’ into the Catholic world as well, and in the more charismatic gatherings in our Catholic churches, this song had gained much traction. Yes, even in a Catholic church, it would be hard to find anyone who isn’t able to complete the phrase “God is good” with “all the time”. One of the big gripes that many atheists have is that God must not be good if there is suffering in the world. I have written and reflected at some level on this topic before in my blog, and I strongly believe that it is something which all of us need to do on a regular basis. Whenever we look at the news reports of dispossessed people, disenfranchisement, ethnic cleansing, abuse, the sufferings of people who are affected by natural disasters and lives ravaged by illness and ending in death, it will often be the fodder for atheists to say that the existence of these in life simply goes to prove that the God of love and goodness that we adore and worship is a figment of our imagination, and that no God who is a God of love would ever allow these to happen. While it is tempting to pray for an immediate end to these forms of suffering and adversities in life, and asking for God’s sovereignty to reign supreme, it oftentimes doesn’t work out that way. So what happens when it is still dark, or when death seems to have its sway? I have been praying these past few months for many people who have been facing difficulties and challenges in life, particularly for those who are battling debilitating illnesses. One in particular was a lovely and tenacious 8-year-old girl, Ava Lee, whose life was visited by the same kind of Leukemia that I had. In fact, she was the only other biphenotypic leukemia patient I had ever met since I was diagnosed with it myself. One may think that having Leukemia is rare, but having the biphenotypic strain is even rarer. Apparently statistics show that only 5% of leukemia patients are afflicted with this hybrid strain, and it is particularly challenging to treat and recover from. I shared something rare with Ava. When I made my first visit to my stem cell donor in Chicago two years ago, Peter introduced me to Ava and her family. She was the eldest of three children of Peter’s former Pastor in their Chinese Christian Church in North Chicago. At that time, Ava was 6. She was a most endearing child, a delight to meet and chat with, and had a charming ability to engage adults in conversation. What shined clearly was her faith, even as a tiny child. I remember posting a picture of Ava taken with me on my blog when I wrote about meeting her. Whilst my own journey after my much-needed transplant went from strength to strength after getting Peter’s perfectly matching stem cells, Ava’s journey after transplant had been one that encountered much struggles, infections and speed bumps. She was truly a strong fighter and even stronger in her faith in Jesus. It was with much sadness that I read on her mother’s blog that their family rallied around Ava to see her breathing her last just one minute after midnight on New Year’s day this year. 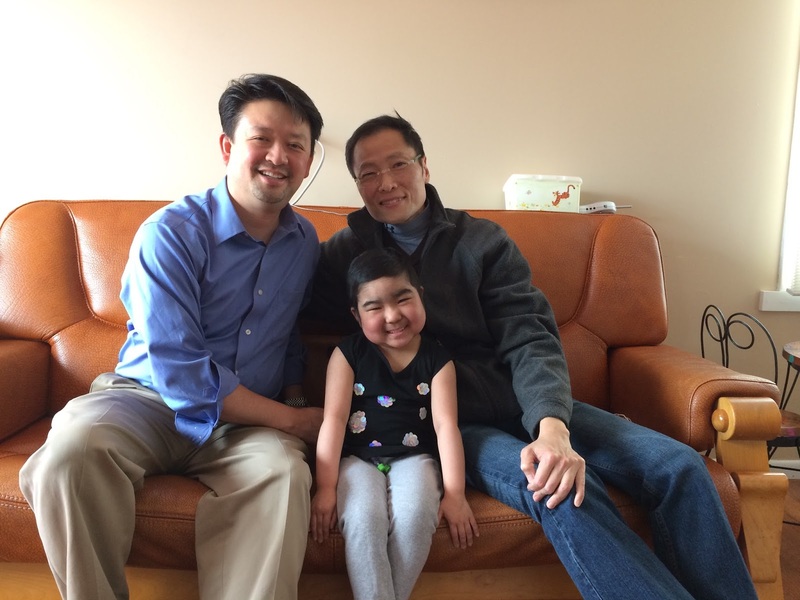 Esther and Mike Lee, her faith-filled parents experienced what no parent should – the death of their child. In such moments of darkness and anguish, it is always tempting to say that God is not good, or if he is good, well at least he isn’t good at that time. It may appear that death had won, and that God doesn’t have the last say. I say ‘tempting’ because to do so is to fall into despair. Despair is what the Christian life fights so much to overcome. What our faith in Jesus Christ as Lord gives us is hope – no matter how dark the times or situations can be. God the Father is no stranger to the experience of losing a child. He tasted the bitterness of it on Good Friday when Jesus breathed his last on the Cross. Despite this, God’s goodness never wavered, and he still loves us despite what sin had done to his son. When we say that God is good all the time, what we have to mean is that in his very essence, in his very being, God is always good. That fact never changes, and it never changes especially when things are not going well for us. His goodness is never predicated on how happy or sad we are. His goodness is not only apparent when there are no dark clouds on our horizon in life. Readers of this blog, I ask that you pray for Mike and Esther Lee, the grieving parents of Ava in this time of great need. They have two other children who also are grieving now as they grieve the death of their sibling Ava. Hold them in your hearts, that even in the pain of their separation from their beloved Ava, they will not waver in their belief that God is good. Because he is. All the time. May I also please ask you to pray for the family of Jalen,10, who passed away due to brain infection a few days ago. We pray especially because its been devastating for the parents and family members. May they also know that Mother Mary also suffered the loss of her son Jesus, and that Jesus rose to assure us all of the hope of everlasting life. Mother Mary, please intercede for Jalen's parents and family on earth that they may remain strong in their faith. Amen. "So what happens when it is still dark, or when death seems to hold its sway"
And yet like you said, if one were to keep in mind that - "our faith in Jesus Christ as Lord gives us hope – no matter how dark the times or situations can be...." - for the Father knows what it is to lose a Son....then the grief & darkness would not cause one to spiral into despair....I like this! Than this world dreams of." Dear Fr Luke, imagining the soul that little Ava had makes me think of a testimony of a woman who tried to jump off her building to end her misery, but she ended up paralysed waist down without dying. She then heard God saying, "You've had a healthy body but a crippled soul. From now on you will have a crippled body but a healthy soul" and she has reached out to many about God just by having conversations over the phone. We can never understand God's plans in this life, but I guess that's what faith is. You can't call it faith only if you see it. Children of faith and with faith always amazes me. Reading this makes me think about myself fighting a debilitating illness too. What little faith I have compared to this beautiful girl. Offering up my sufferings for her soul tonight and that her family will be comforted.